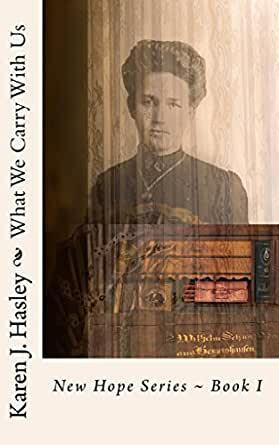 What We Carry With Us (New Hope Series Book 1) - Kindle edition by Karen J. Hasley. Romance Kindle eBooks @ Amazon.com. The inhabitants of New Hope, Nebraska, have done their best to put the Civil War with all its turmoil and devastation behind them. By 1878, the town is prospering. Three daily railroad stops. Groceries, feed and grain, hardware, and leather goods readily available. Bank, doctor's office, café, and barber shop. Its own church and school, preacher and teacher. A civilized community with all the marks of progress. That's what the hard-working members of the Merchants' Association believe until the day New Hope's telegraph agent – young Eddie Barts – disappears, and suddenly life in New Hope changes. Widow Ruth Churchill, barber and owner of the town's finest boarding house, has lived and loved in New Hope for over a decade. She calls it home and its citizens friends. Five years after the death of her beloved husband, Ruth has managed to find peace and a kind of happiness. But with the disappearance of Eddie Barts, Ruth will find her world and her life turned upside down. Despite all the trappings of civilization, something – someone – evil is hiding in New Hope. For years, unknown to anyone but one relentless searcher, a wicked man of violence and deception has been living behind a mask of respectability. Before his mask is ripped off, Ruth will experience suspicion, doubt, danger, and fear. Her own life will be at risk. Her own heart, too. Because along with terror and grief comes love. They live side-by-side. When it's all over, New Hope, Nebraska, will never be the same. And neither will Ruth. Karen J. Hasley grew up in America&apos;s heartland. Research into 17th-century female poets showed her the rich treasures in women&apos;s lives of the past, and in 2006 Karen&apos;s first novel, "Lily&apos;s Sister," hit the stands. The rest is - quite literally - history. Do you recognize these American women? Jane Addams. Ida B. Wells-Barnett. Dr. Alice Hamilton. Dr. Kate W. Barrett. Donaldina Cameron. Gertrude Stein. Mary Cassatt. 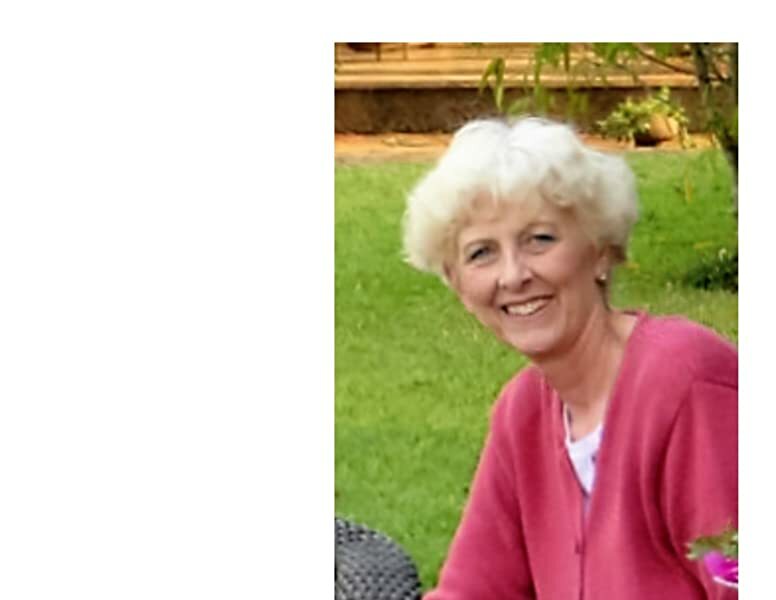 You&apos;ll find them all in Karen&apos;s books, which often intertwine the lives of fictional heroines and historical real-life women so closely and convincingly that you may need a history book to figure out which is which. The author&apos;s first stand-alone novel "The Dangerous Thaw of Etta Capstone" was a quarter finalist for Amazon&apos;s 2013 Breakthrough Novel of the Year, the PW review stating it was "subtle and effective." "Magnificent Farewell," a second stand-alone set in World War I, was a "highly recommended" finalist in the 2016 Wishing Shelf Book Awards. In 2014, Karen offered readers a trio of light-hearted Victorian romances. The Penwarrens Series ~ "Claire, After All," "Listening to Abby," and "Jubilee Rose" ~ is an affectionate, admiring homage to Georgette Heyer. Karen returned to America&apos;s heartland in 2017 with a new series set in 19th-century New Hope, Nebraska. As readers have come to expect, book 1 "What We Carry With Us" offers mystery, history, and romance with an engaging, strong-minded woman at its core. Visit New Hope again in book 2, "Surprised by Shadows," for another rousing adventure featuring one of Hasley&apos;s signature heroines. Remarkable women. Unforgettable stories. All in historical settings. I read novels to escape from the barrage of reality news that is often disheartening. It was refreshing to read a work of fiction that reflects sane, common sense, believable reality through the eyes of Ruth Churchill and her time and experiences in an historical setting. The story has an intriguing line of suspense, reflections of the good and bad in people, and a solid, engaging love story that unfolds beautifully. One quote that really spoke to me: "The world is full of things we never meant to happen but that happen, anyway, usually in spite of our intentions and not because of them." This rings true in people's lives and makes "What We Carry With Us" timeless as well as perfectly set in its time. I'm not sure what made me pick this book, maybe it was the rural setting that made me remember all my 8th grade Nebraska history. It's part murder mystery, part historical, part romance, all enjoyable. I especially liked Ruth, she was awesome! A widow in her late 20's who runs TWO businesses: a boarding house that she inherited from her mother, and the barbershop that her late husband owned. She's a bit of a novelty (a female barber, oh my!) to the train travelers who come through the town, but she's respected and liked in her community. Ruth is hard working, a friend to almost all, and someone who voices her opinion when she has something to say. I appreciated the fact that this wasn't a "wild west" type book, gunshots in New Hope were almost unheard of, and crime was rare. Murder shocked the town, and unfortunately showed some of the townspeople's true colors. The ending was intense and satisfying. I'll definitely be reading the next book in the series. Karen J. Hasley is one of my favorite authors of historical fiction. She's an excellent writer, and her books are all well researched and her characters well drawn. Her women protagonists are strong and her heroes are sigh-worthy. The romance in this book unfolds beautifully and with such deep heartfelt emotion that it almost brought tears to my eyes. The whodunit mystery kept me turning the pages. I cannot wait for the second installment in this new series. A Nebraska town where a train stops 3 times a day and once on Sunday. Not much happening until a young man is shot and killed and a lawman rides into town. An somewhere hiding amongst them is a man who is trying to pass for normal but is old blooded killer and thief. Great read and I am looking for to the next in this series. I love historical novels for helping me "live" in these distant times. A good town full of neighbors........and tragedy strikes fear in the townspeople. What a good read....mystery, a little romance and well turned storyline. Post civil war life in a small town on the Nebraska prairie. This story tells of one man’s search for a killer and a woman building her life after her husband’s death. I liked the homey way this was written. It's a relaxed story even while the suspense built. Don't know how to better express my thoughts except to say I enjoyed this book very much.